I think I am a pretty good mother. I try to do all of the things that good mothers do. My children are my focus. I strive to make sure that they are happy, healthy and well-adjusted. Most days I walk around confident(ish) in my mothering abilities. Then I have to take one of my kids to the pediatrician. Children are supposed to get a wellness check up once a year. Everyone needs a yearly exam and children are no exception. I feel relatively smug about actually remembering to make the appointment, in the first place. Then the day arrives and I actually remember that we have the appointment. Bonus. Well, once I didn’t but most of the time I remember. Today, the doctor can see what I already know. My child is the picture of health. Clearly, because I am Mother Amazing. It always begins positively. We follow the nurse to the back. She takes his height, weight and blood pressure. I am assured that the numbers are phenomenal. The nurse even gives me a little wink. Mother of the year. Next we are placed in an exam room to wait for the doctor. This is where every thing begins to unravel. Please have your child undress down to his underwear and put on this gown. Seems simple enough. I got this. The nurse leaves. 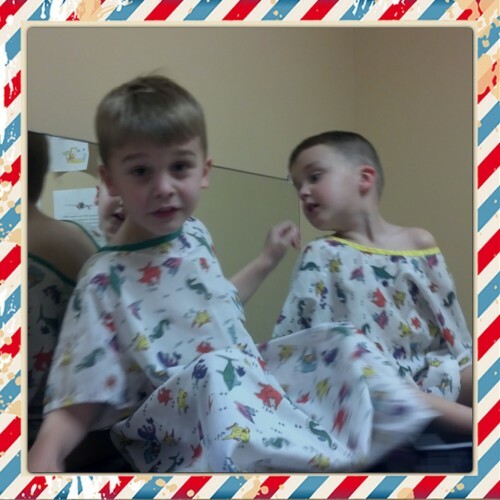 My son instantly tells me that he is NOT going to let the doctor see his underwear and he is certainly NOT wearing a “lady dress”. I am well aware that nurses and doctors are just on the other side of the door listening. In my sweetest, most reassuring mom voice I tell my child that everything is perfectly fine. Mommy is right here and the doctor is only trying to do her job. Once again he shakes his head no. NOW I have officially been challenged to a wrestling match. I will get him out of those clothes and shove him into that lady dress, if it’s the last thing that I ever do. As I approach the screams begin. Arms and legs are flying, mine and his. I give him my best crazy mom look, with raised eyebrows and clinched jaw. You do NOT want to be heard screaming at your child. Not here. I didn’t remember him being this stout. I whisper in his ear that if he will wear the gown I will buy him ice cream on the way home. We negotiate back and forth, and before I realize it, I have agreed to ice cream AND a skate board. He puts on the gown. We stare at one another, each believing to be victorious. In walks the doc. I sit there smiling, hoping she won’t notice the perspiration on my upper lip. She sits down with her clip board and begins to ask HIM questions. Before I know it, I am involved in a situation that feels similar to what an FBI interrogation must feel like. How many ounces of water do you drink a day? Milk? Juice? (What does a kid know about ounces?) How many servings of vegetables do you eat a day? My son responds: none, never. Strike one. The doctor looks at me over her glasses. I feel like I should interject here, make her understand my struggle. She is not interested in my side though. She has her answer. How many hours of sleep do you get a night? Six. Did he just say six? Obviously the boy sleeps more than that. Why is she asking HIM these questions? I blurt out that he actually sleeps 10 to 11 hours a night. Why is she not changing the answer on her pad? How many hours of tv/video games do you play a day? Oh boy. Do you wear a bike helmet every time you ride? My son responds that he does when he feels like it. What is this kid doing? It is already obvious that I was not handed the rule book when I gave birth. Suddenly, I am overwhelmed with feelings of inadequacy. Of course I prefer my child to drink milk or water with his meals. Of course I beg and plead with him to eat his veggies. It only makes sense that too much tv/video game time a day will turn his brain into oatmeal. Why is she recording all of these responses? Is there going to be a detailed report? Suddenly I feel light headed. I have lost all control of the situation. Why can’t we just get to the physical? I exhale for the first time in 10 minutes. She does the exam, tells me that he looks great, shakes my hand and walks out. That’s it? What is my score? Did I pass the parent test? Should I expect unannounced visits from child services? I quickly remove the lady dress, which he now insists that he wear home. I dress him, grab my handbag and we make our way down the hall. I hold his hand as I glance over my shoulder to see if they are actually going to let me leave with him. Once outside the building, we hurry to the car and drive away. All the way home I reflect on being a parent. We all want our kids to eat healthy foods. Are there times we give them ice cream for dinner? You’d better believe it. Are they always well rested, having slept ten hours? More times than not. Have you ever been so ragged from the demands that you find yourself screaming “I don’t care what you do, just leave this room!” You better believe that happens. Am I a perfect mother? Goodness no. There’s no such thing. Am I a good one? I think so. I made it through another wellness visit and I managed to retain custody of my child. What is most important is that I love my kids and they know that. Doesn’t he look happy licking that ice cream cone?